Need International Auto Shipping help? Consolidation in 40′ container high cube. Exclusive 20′ or 40′ container. The car is driven into a special designated place on the vessel for automobiles. Upon arrival at the destination port, cars are being unloaded from the vessel. Please note: this service is not offered for all ports. This is the most common way of shipping a car overseas. Your automobile will be consolidated into a high cube 40′ container designed to carry 3 or 4 cars depending on their size. Motorcycles can be loaded and positioned at the remaining space in the container. Price is based on the car’s size. 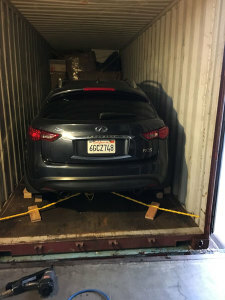 Cars can be shipped in an exclusive container. Thus, access to your automobile and container is under your sole control. 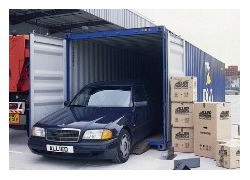 Aris Export will position your exclusive container at the loading point, a professional car loader will drive your car into the container and will secure it for safe transition. You will be the only one with the keys to the container. At destination, the container will be opened by you. Your original pink slip/Certificate of Title must be provided to us, since we have to clear your vehicle through US customs. Aris Export will NOT ship any car outside the borders of the USA without a pink slip/certificate of title. Contact Aris Export to learn more information about international auto shipping.